Traumatized by visits to the nursing home to see their elderly aunt, Louise and her sister Jeannie, made a youthful pact to not live past age eighty. Was it a silly childhood idea, or were they wise beyond their years? Most importantly, will they go through with it when the time comes? Will they go through with it? And will Louise’s romantic dreams of a life out west ever come to pass? Those questions were fervently on my mind as I quickly turned each page in anticipation. This is a must read story for women of all ages, written by an excellent writer. Author Kim Cano, cleverly weaves together an endearing life story of two sisters journey through life with all its challenges and obstacles. This is a highly emotional read as the characters experience happiness, joy, sorrow and loss. But the writer seems to expertly pull it off as a splendid “feel good read,” leaving readers with a sense of happiness. I absolutely loved this story. I couldn’t put it down. The plot development is thoughtful, skillful and exceptional. The characters were so well developed, I felt I knew them myself. This is one of the most well written books I have read in a long while. It’s evident and unmistakable that Kim Cano is an educated experienced writer, with a unique voice and beautiful literary prose. Brilliantly structured, moving along steadily and continuously, the story flows through time with ease and purpose, and with a means to the end. The way she was able to pass through time so smoothly and eloquently really impressed me. Right from the start, the exciting plot and stage is set, getting the readers minds engaged and locked into the storyline, making it very difficult to put it down. How will this turn out? The question burned into my mind throughout the entire read. I found myself secretly pleading with the author, quickly turning the pages, to give this story the end it deserved. She did not disappoint. In fact, the ending was well worth the anticipation. The dialogue between characters flowed so well, I was astonished. This was a smart read. Well written with no grammatical or other errors, making the readability pleasantly enjoyable. Eighty and out is also filled with wisdom, soul searching, and self-realization. Very engaging and relatable. I learned a lot from this story, things that I can apply to my own life. Kim Cano is one talented, passionate and extraordinary writer. I highly recommend “eighty and out” to all women that love a good chick lit read that is written with creativity, knowledge, wisdom and passion. 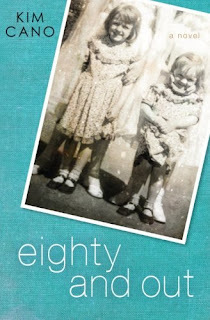 Click to Purchase "eighty and out" by KIM CANO now.